It was the morning after the night before at Brophy’s Tavern in Carmel. 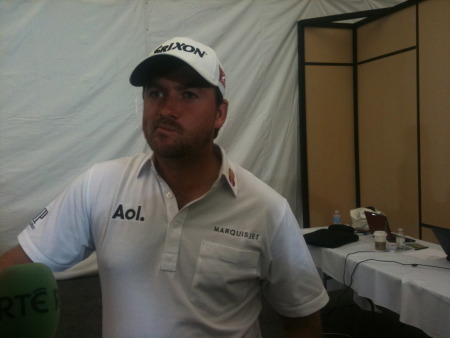 Graeme McDowell’s manager Conor Ridge - dubbed Jerry Maguire by the new US Open champion - was fielding calls every second. One minute it was the Six One News, then Des Cahill. Earlier he had organised appearances on last night’s Jay Leno show and a possible, walk-on cameo in the season-ending episode of the mega-hit series “Entourage”. Hearing all this going on, McDowell knew it couldn’t be a dream. But he hardly dared to open his eyes, just in case. Now that he’s come to terms with the reality of his stunning one-shot win over Gregory Havret at Pebble Beach on Sunday, McDowell has to get his head around the fact that he’s a major champion. It’s a massive step up in class for the man who jumped 24 places up the rankings to 13th in the world and to second in both the qualifying lists for October’s Ryder Cup. He once looked at young guns like Rory McIlroy and Ryo Ishikawa and wondered how much longer he’d be capable of winning the really big bucks. Now he’s set up for life and he’s got a major title to back up his pedigree. His heart-stopping one shot win over Gregory Havret on Sunday meant he earned a cheque for €1.12m and now tops the Race to Dubai standings with earnings this season of €1.88m. He’s already for more than €8m in eight years as a pro. But there’s a lot more to come. Bonuses from sponsors will bring in another million euro plus. Then there’s the massive fringe benefits - a 10 year US Open exemption and a five year pass for the other three majors. He’ll take up his PGA Tour card and play in the season opening PGA Tour event. He may even play the FedEx Cup and pocket another $10m for winning that. The biggest plus of all is the title that no-one will ever be able to take away from him no matter what happens. But while McDowell is somewhat intimidated by that thought that he is now expected to play like a major champion, it’s a problem worth having. Hell, he’s up for it. Having played like a superstar when Tiger Woods, Phil Mickelson and Ernie Els folded like rookies on that pressure packed final day, it was amazing to hear McDowell doubt himself for an instant. “I don’t know if I am ready for that. It’s funny. My caddie said to me yesterday that we can deal with failure. We know that because we have been there, because we have dealt with failure in the past. “But he said, can you deal with the other? Can you deal with this win? Know what, as I stand here I am not quite sure. McDowell is now ranked two places ahead of Padraig Harrington at 13th in the world rankings and the Dubliner was one of the first people to slap McDowell on the back when he walked into Brophy’s Tavern on Sunday night. He’s been there, done that and bought the tee shirt and while the Dubliner knows it’s the kind of pressure that every player dreams of having, he warned McDowell that winning a grand slam title doesn’t make it any easier to win another. “It brings a huge amount of pressure,” Harrington confessed, “but it is what you want to do as a player. It is the goal you have been looking for and I don’t think it relaxes anybody. Despite that, Harrington sees no reason why the Ulsterman can’t keep his red-hot run of form going following his back-to-back wins at Celtic Manor and Pebble Beach. “He has played well for three, four months at a time. It is not a gradual curve, he goes up and stays up but it has been improving over the years and I would see him playing very well off the back of this,” Harrington said. McDowell was simply relishing the moment. Standing on the balcony of his hotel he still found it all hard to believe. Imagine how his little brother Gary was feeling as he watched the kid the whole family now calls G-Mac heading out to do battle for America’s favourite major - the US Open. It was the stuff of dreams but Graeme McDowell was trying not to get too caught up in memories of those far off days when the two of them begged their dad Kenny to take them down to the local pitch and putt. Manager Conor Ridge with his first major champion on Sunday night Watch out America. Now that Graeme McDowell has the US Open trophy, he wants the Ryder Cup back too. The 18th at Merion. Picture by Mark E. WangerinIf the Philadelphia Police Department were to issue an identikit picture of the man most likely to steal the US Open at storied Merion next week, he’d look a lot like Graeme McDowell.